Just took my kids there for my first return since 1986 to sled down the hills. What a time we had and at least I found out that those snow covered hills haven't changed!!! That was fun for all of us, and did that visit ever take me back to my youth! 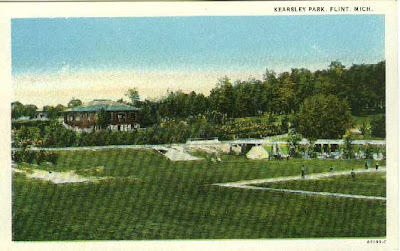 I remember Kearsley Park. I lived on Kansas. We use to play, swim, and sled at the park. I remember the burning of the Christmas trees in January. The ice rink at the pravilion and the fireworks in July. My son played at the park before we moved. I can remember the Capital and Palace, Saturdays downtown. But Kearsley Park in the winter was the greatest, with the snow and the hills. I miss Flint now. I just wrote about Safetyville in my journal. What a wonderful and scary place that was as a child. I will always remember to watch for "stale green lights" and train tracks! Here's a link to all the posts that touch on Safetyville, including some photos and even a driver's license. It is great to see this and relive a good memory of Flint. I lived on Kearsley Park Blvd as a child and Safetyville was one of the regular places I escaped to so I was gutted when it closed down.